I was a little more than surprised the other day when I started digging around on the old blog, and realized I had never really shown enpi in action. I see why though. Apparently, five and a half years ago, I was absorbed with WordGrinder and didn’t see much potential in enpi. 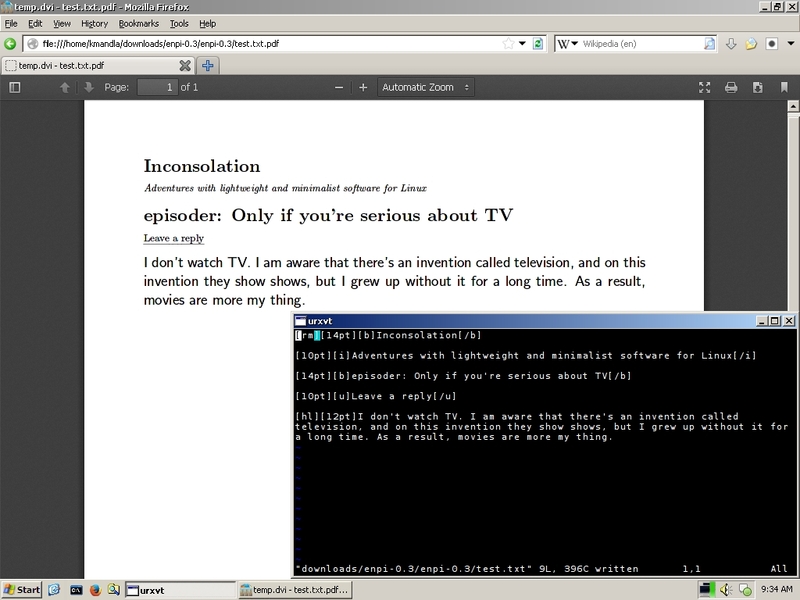 enpi does the job of translating simple text codes into specific commands for LaTeX. As such, it really doesn’t stand as a word processor on its own … rather, it’s more a filter or a converter from simplified text to what LaTeX understands. Which explains my lack of practical use five and a half years ago: I was looking for something to behave like Word 5.5, not just a conversion script. I will give enpi credit though. As you can see above, it does an impressive job. But all the actual word processing is going to require an outside application, i.e., the text editor of your choice. So technically speaking, it’s true: enpi isn’t a word processor. enpi has some other limitations. As far as I could tell, you’re limited to two (three?) fonts and three point sizes. There are subscripts, superscripts and a lot of font effects though. Some characters jam up enpi, and as a result you can get error messages in the conversion process and garbage characters in the final PDF. Curly quotes, for one, give enpi a headache. On the other hand, I don’t know of too many applications — scripts or otherwise — that can give you such lovely output with a minimum of effort like this. And not force you to learn an entire new application, commands, etc. This entry was posted in Linux and tagged latex, pdf, processor, text, word on 2013/10/27 by K.Mandla. Ehh. The markup language leaves a lot to be considered. I much prefer a lightweight markup language like AsciiDoc or Markdown. LaTeX is an ugly hack, but BBCode-inspired syntax is not much of an improvement.